Is Yik Yak a thing anymore? Not so much, according to download stats, traffic charts, surveys and a source that says the college app’s monthly user count has been declining. That source — with intimate knowledge of the company — also tipped me off that Yik Yak‘s original CTO Tom Chernetsky has bailed, which the startup now confirms. He’s not the only one who thinks the supposed rocket ship won’t fly as high as some expected when Sequoia led a mammoth $62 million at $400 million valuation in November 2014. Since late last year, Yik Yak’s VP of Product, Director of Engineering, Lead Product Designer and other senior employees have departed. However, the hometown CTO’s departure could have been catalyzed by the recruitment of seasoned Google Director of Engineering Michael Morrissey, funded by the Sequoia cash. Morrissey leads engineering at Yik Yak, and Chernetsky might not have enjoyed being in his shadow. But it’d be hard to leave an exec role at a startup if everything was up and up. It seems that the luster of posting anonymous gossip, jokes and bullying may be wearing off, as it did for Yik Yak’s dead cousin Secret. My source says Yik Yak has built a direct messaging feature that it’s preparing to release, but even jumping into the chat sphere might not be enough to revitalize the wounded animal. Months after Sequoia pumped a ton of cash into the Atlanta startup, download rates and traffic began to drop, according to App Annie and comScore charts dug up by GigaOm. Things have gotten worse since, as Google Play dropped it from its charts last March, likely due to hate speech in the app. This week, App Annie shows Yik Yak sank to No. 63 on the download charts amongst U.S. social networking apps and just No. 1067 amongst all U.S. iOS apps. That’s compared to No. 21 in social and No. 141 overall on April 3, 2014, No. 26 in social and No. 300 overall this date last year and a peak of No. 2 in social and No. 3 overall in September 2014. While comScore’s exact numbers aren’t always accurate, the directional trends are typically reliable. They show a decline starting in late 2014. 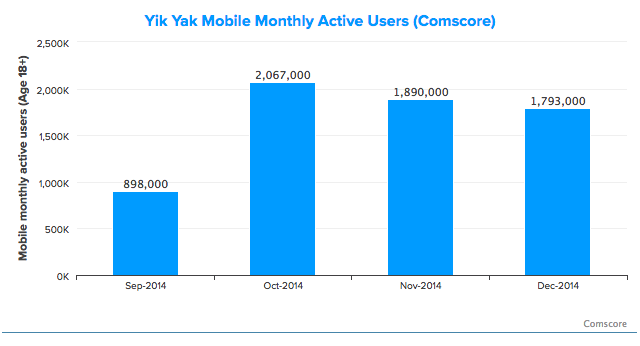 Now comScore pegs Yik Yak at 1.76 million monthly mobile users over 18, essentially flat from 16 months ago. A small Tech Insider survey last month didn’t place Yik Yak in the top 15 apps amongst college students after once being the big startup on campus. These stats all mesh with what my source says, which is that Yik Yak has had zero significant growth in over a year, and consistently misses its growth targets. They cite 4 million monthly active users as the count in January, noting the number has declined since then, though I can’t confirm that exact number. 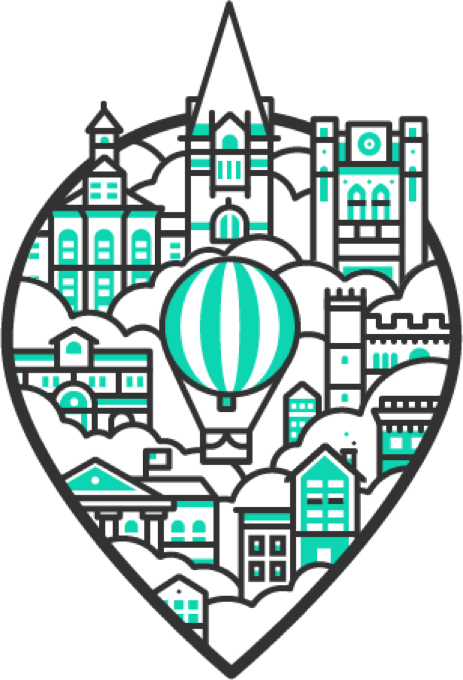 The lack of more obvious growth is also worrisome considering Yik Yak has quietly begun pushing for international usage in English-speaking countries like Ireland and Australia. 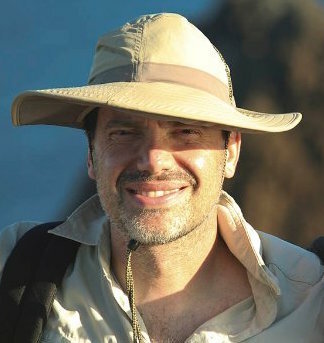 The startup initially tried to block overseas users until it was ready, according to this great history of the startup written by Business Insider’s Alyson Shontell. Naturally, Yik Yak PR defended the company, insisting that “growth and usage is very strong.” They claim the number of active colleges on the app is now at 2,000 and counting, and the company is hiring. But without more concrete metrics to counter publicly available data, it’s tough to drink that Kool-Aid. To become a powerful social network that can survive on ad revenue, Yik Yak would have to get a lot bigger. Right now it might only have one-third of the 12.2 million U.S. college students on board. But even turning them all into loyal Yakkers might not be enough to justify its valuation. The problem with anonymous apps is that over time they start to feel exhausting. The crude stories, played-out jokes stolen from Reddit and cringe-worthy bullying wear on people. While they might have a few juicy quips of their own to share, blowing off steam can eventually feel pointless. That’s why my Secret and Yik Yak usage dried up. Yik Yak’s product has continued to plod along, despite some colleges’ attempts to ban the app for facilitating cyberbullying. But nothing has made it feel fresh again. 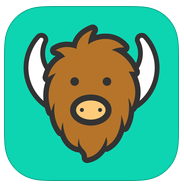 Yik Yak began allowing photos but no faces last July, and launched a web client in January. Then, in a move that seemed to confuse some users into thinking Yik Yak was no longer anonymous, it opened the option to post from a handle/screen name rather than having always have no identification attached to a post. That last feature unlocks what could be a make-or-break feature for Yik Yak — chat. According to my source, Yik Yak plans to open private messaging between handles, so if someone says they’re lonely, kids could try to cheer them up (or shamelessly hit on them). Or if they think someone has been through a similar situation they could celebrate or commiserate with them. Chat has proven to make apps stickier and Yik Yak could use the retention, judging by the charts. The startup will have to find some way to break out big time beyond the U.S. college market, despite refusing to allow high-schoolers in to prevent more bullying. Luckily since the startup is headquartered in Atlanta, Georgia, its employees are less likely to get poached by other tech companies than they would be in Silicon Valley. But maintaining morale must be tough. All college kids seem to talk about these days is Snapchat and Instagram, when a few years ago it was Yik Yak on the tips of their fingers.